Hey guys! sorry for the long no updates, but have been mighty busy talking to some more sponsors! I will post some updates later tonight, word from Ben Burns (Regent) and also Overdrive. Also been talking to some people in regards to some suprises on the Sunday. the scheduled release dates for a few items. 1/60 series released earlier if there's anything someone missed. want a totaly undamaged box you should not be buying it in this manner. We will put cushining in the box but the item itself will not be wraped. you guys before we start doing anything. This doesn't mean we can't go halvies or thirdsies with EMS to get in the Max TV-1A or VF-11B. We will save a buttload on shipping. I wish i could tell yas the suprise on Sunday that's planned, it's going to be a f'n laugh. I've bought my ticks to and back already. Hey guys! Aikurisu is going to post this for me while I’m afk from the comps, Thanks Aikurisu for your help!! Below is discussion with Overdrive with regards to the special con group order deal/s. so Overdrive can make arrangements for the packages and what else they are sending to us for the con, Cool. items by the following date. We'll ask for half of the payment for them within a week of the order. Shipping via EMS for a box of non super parts VF-1's should be $100. The Kakizaki 1/60 and VF-1A Max Movie versions were official announced yesterday but since they're all scheduled for May don't think it'll get there in time even if you send it by EMS. Also if any one's interested in the Beagle Ride Armor we can do that to if you need any. Don't forget I need at least an estimated number for a few items by the next Monday. I'll send you a head up on friday. Cool thanks for posting that Aikurisu. Well i'm back! And posts are as slack as ever. I'm gonna think about making the deadline in the next month. Kensei is in for a VF-11B group buy. So that's two boxes probably with the ones i'm getting and the one 1D ScreamMan is wanting. For people wanting to get in touch with me, contact details are front page. Another month down and a new one started. It won't be long until the con. I have a few extra items lined up for the display. RuskiiVFaussie I will send a list of what I propose to bring for the display by the end of the week. Cool mate! Thanks for dropping by, i know your flat out busy. Yep, not long now. Are there any updates on the CON t-shirts? Love to get one of each in XL . Can't wait til May, your doing a great job RuskiiVFaussie! Hey Ralto mate! Sorry for the long no reply, the con shirts are still being finalised. Don't worry you'll be one of the first to know about em when they are done! HeyYS - check this out. Hopefully they will sponsor us, that'd be sweet! I'll pop back when i have some more to bring youz up to speed, i've started to gain interested outside these sites (international forum such is MWorld and RT.com) for seat numbers. Hoping we'll get some enthusiastic new fans! You guys that frequent other anime forums.. please place these in your sigs with links to promote the con k? I will be contacting as many aussie anime forums as time permits me this week. 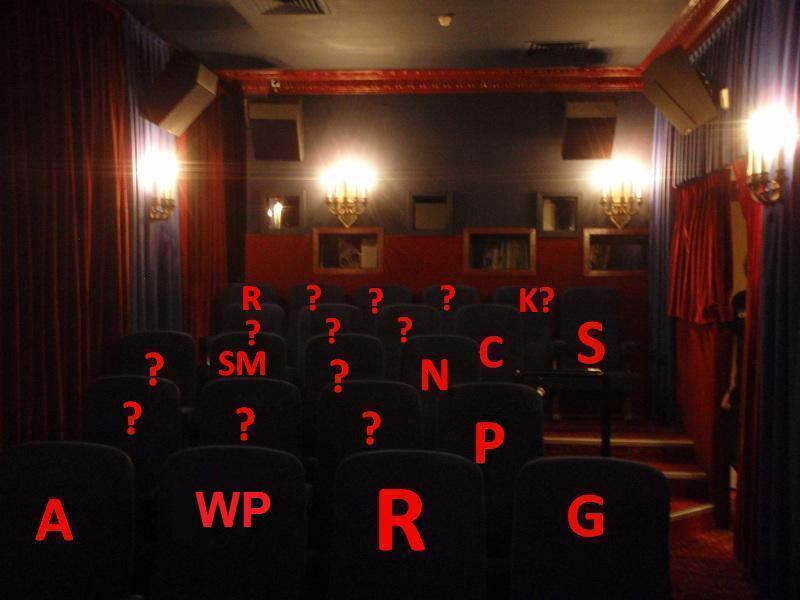 My aim is to fix up the seating vacancies (and hopefully get word from you guys that are coming but need that double comfirm right???) this month. Don't want to leave it too late. Thank guys! Spread the word! Can i get a full count of MAF PSP Comp players? Grande Finale Prize is going to be awesome. And true to Macross. That's all i will disclose. I know of what... 3 people with MAF (Macross Ace Frontier for PSP). Come on lets get some more playas in the comp! The 'Grand Final' will be restricted to both pilots using standard VF-1's of the same head variant. equal against equal. No armour/strike/super FP's either. It's a con based around the original SDF series and DYRL? celebration, next years con will be probably Plus orientated, dunno, how about some feedback from members here? As for the YF-21, i think it will be banned, unless we have mission based comps, but i'm leaning more towards VS comps. Also thinking about banning missile Spam, but i'm looking into how to rule it. Like in reality, you can only fire so many, so i guess we can limit it like that. That's a great image to use for the promotion of the con Matt. I'm still working on getting a PSP on time for the con. Shazzam mate, if there is any improvememnts you reckon we should add let me know ok? IF you guys do get around, please i can't stress how important it is to spread the word out for the con to get it the biggest we can get it. Cheers! hmmm!!! have any cosplayers showed interest so far? i wanna see some pix of them at the MacAusCon ! Who's up for paintball too? Good Paintball goes for a good 6 hours, so we have to take that into consideration, and there's no daylight saving in the eastern states. hmmz, well i know i'll have friday off for the majority, we'll plan it out ok? Damn, one hell of a weekend. Hey best news looks like we could have another seat filled by one of our talented mates! i'm stoked! Shazzam mate, you wanna post up what your going to bring along to the con??? Don't keep it to yourself and me, let everyone else drool at whats in store. Hell yeah, Warpaint22 has confirmed he's coming to the con guys! And he's dibbed the front seat that was vacant. You guys that said you were coming in the old thread, would you like to re-confirm please for the good of the con? I'll send out a mass PM next week, remember payments aren't due till a month before the con, so still heaps of time to save up 107 bucks. big screen, which is going to be a one off! Future cons will be held in all the other states main cities which haven't had a con yet, like Perth, Sydney, Melbourne and Adelaide. 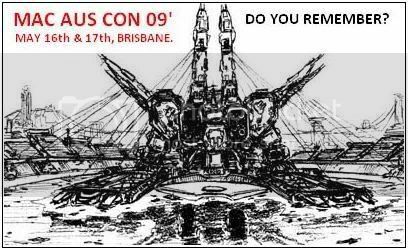 It's a Macross Fans dream come true this con. ScreamMan - your still looking for a share-up? Warpaint22 should be up for it, please send him a PM when you get time mate. Everyone who is bringing stuff to the con, could you please let me know what your intending on showing on the day?? 1. we don't want to double up, as with the PMs i'm getting we have quite ALOT coming! 2. so i can work out on how many display cases we need to hire. A 40cm x 30cm space will be plenty to display them if you'd like me to bring them along. I may be able to purchase a Bandai Max DYRL 1/55 scale VF-1A with SAP and a Yamato Max TV version 1/60 scale VF-1A in time for the con. I will also bring all of my Macross games and books. Hi all, back on the forum been gone for a while if you noiced....lol. Anyway Ruskii has asked the following inside info to be posted and as I have more spare time I've been happy to be involved with the con as it's been a long time comming and a good chance to have some macross fun. Ruskii has been very busy with all the organising and is happy to report that he is negotiating with a popular Anime Magazine for sponsorship and with luck some cool prizes. All this is leading to a great convention. I myself am at work on a momento for all "Saturday" con attendies to help remember this event, so please make sure you have confermed your place on the Saturday as numbers will soon need to be finalised so get your seats. OK..... for displays Ruskii has been at work and making sure we have plenty of room which we should have to display everything. Below is a reply from Ben Burns (Regent Theatrette) about display space. Along the corridor there we can definitely have tables set up to one side the whole way down. There is only one door that this will obstruct and I dont even think it opens anymore ! haha. As for spare rooms, we might be struggling here. The only rooms we have up there are the two toilets, fire escape and a small electric/cleaners room. None of which could be used for displays etc. Sorry. Definitely room down the front to set up tables for prizes. The speakers are not effected here. Hope this helps. Certainly getting closer now! See pictures of the theatre are at the beginning of this tread for those who haven't read the full tread. So all is comming togeater nicely. More news......a test flyer has been made to distribute around (this is not the final at this stage) , would like to know if anyone in the Brisbane area can help post some around once the final is finished, let us know. Big Big thanks to RuskiiVFaussie for doing up this for us. Also we would love to see some Custom model valks for a Model Compitition, as we need a good comp to give out the prizes from or Great Sponsors. I myself have a plan for a custom Valk (with Australia in mind) which I hope will make the Con, so we'd love to see what will turn up from or modelers. Especially from the Famous PeterB and Cowie. I'm sure every body will be excited to see what will turn out for display. Ahh cheers Warpaint mate! Awesome to see a member hold Macross in high regard! Awesome Cowie and Shazzam!!!! Bring the lot! As you know i didn't realize the room we had up front, so really there is more than enough room for a massive display! Alright, time to rally up these slack arse who haven't re-con firmed their seats.... fun fun chasing yas ya know? It's ok, i'll hound yas. If any of you guys would like to best it with photoshop please be my guest! I think we have a big suprise anyways in regards to a poster! We got another major sponsor!!! Give a big welcome to MECHA STUDIOS AUSTRALIA ! See? This con is bringing all soughts of awesomeness out! Another sponsor...Nice stuff. The con is looking better by the week. Well done Matt. As for those surprises, I can't wait to see. Latest news is that we have another sponsor for the con!!!! We seem to be attracking quite a bit of interest around Australia as word of the con spreads around. I'll post the new sponsors banner ASAP (waiting on it to be emailed). We still have seats to fill so please if you can make it, please place a booking ASAP and pick your seat/s. Nice work on the extra sponsors mate! I'd like to confirm my attendance just let me know when u require desposits. Also, just with regards to members bringing stuff for display, I only have a handful of 1/48s Super Miria, Super Stealth, VF-1S Super Hikky and Angel Bird with Armour and 1/60 Miria Q-Rau. I am happy to bring it all if its needed. 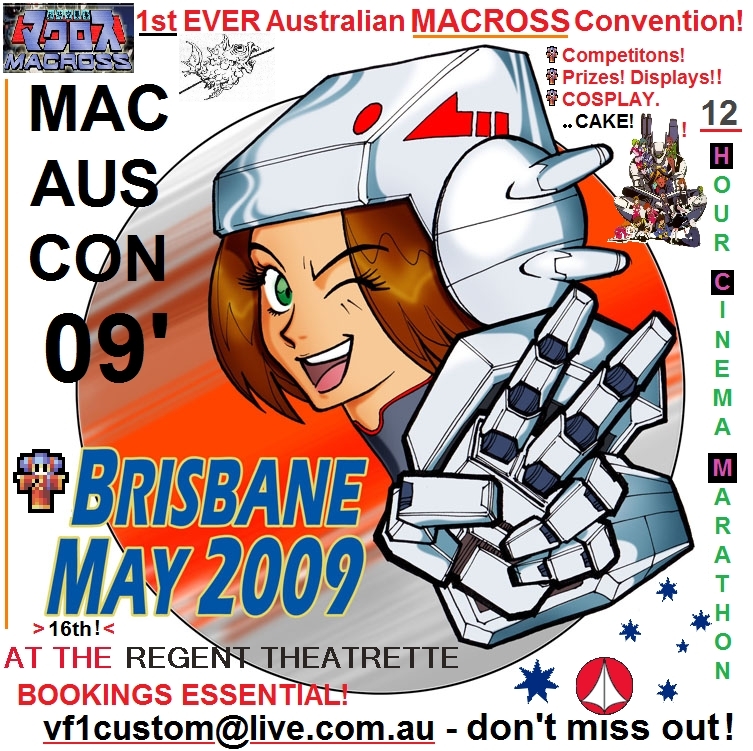 Kepp us posted with the awesomeness that is Mac Aus Con 09 Matt. Heyas! Another week down! They go like days with me and the con build up seriously lol. Live and breathe mac aus con. You can thank Warpaint22 for this new super sponsor!!! I believe we have scored a few more members who could be booking their seats in the coming weeks. Like just this morning i got word from a certain cosplay guru who has expressed his interest in coming! That is HUGE for the con, i want colour brought to the con! Having dinner, so i'll be back to post up the new sponsor banners! You on this weekend?? I gotta fill you in with all the goss!